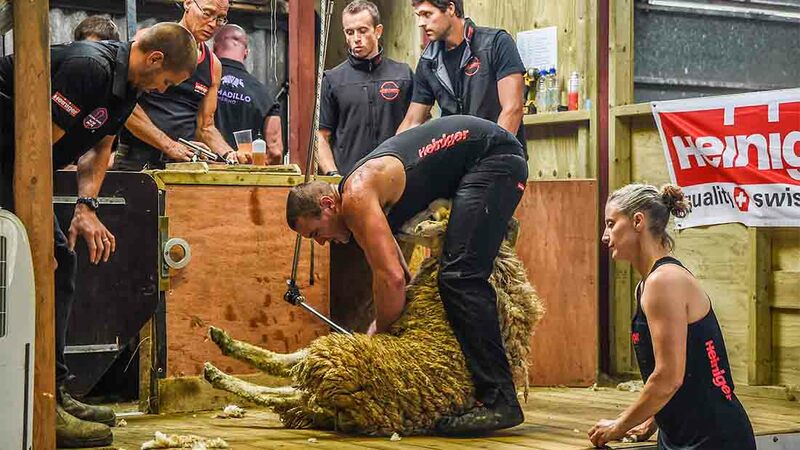 A 32-year-old Cornwall farmer has broken the world record for shearing the most sheep in nine hours. Champion sheep shearer, Matt Smith has broken the world record for shearing the most sheep in nine hours. The 32-year-old, originally from New Zealand, sheared 731 ewes in the allotted time - taking an average of 44 seconds to shear each sheep. The event, supported by the British Wool Marketing Board and held on Mr Smith’s own farm, was the first time a world record of this time had been attempted both in the UK and the Northern Hemisphere. Mr Smith, who runs a flock of 1,385 breeding ewes in Cornwall with his wife, smashed the previous record which was set in 2007 by fellow Kiwi Rodney Sutton, who sheared 721 ewes in nine hours. Speaking after the mammoth event, Mr Smith said he was ’chuffed to bits’ to have set a new world record. "It has not been easy getting here, but all the hard work and preparation has paid off," he said. "It’s been a long-time ambition of mine, and this is proof, that if you’re willing to put your body on the line, you can achieve your goals." Mr Smith began shearing at 5am yesterday (July 26) for two hours, followed by four one-and-three-quarter runs, with half hour breaks in between. A milestone for Matt and an achievement for shearing in the UK, the event also supported a nearby charity, St Austell-based Children’s Hospice, Little Harbour. Mr Smith started training for his challenge last summer, following a very strict fitness regime. Chairman of the British Wool Marketing Board, Bedwyr Jones said Mr Smith has ’set a bench mark for shearers throughout the world’. He said: "I am delighted for Matt, and on behalf of the British Wool Marketing Board, I would like to congratulate him on what was, without a doubt, a phenomenal task, and is of course a tremendous accomplishment. "This challenge has taken a lot of preparation, and he has now set a new bench mark for shearers throughout the world. "Without a doubt Matt’s success will really help to raise the profile of shearing in the UK and importance of a skill, which is absolutely vital to the sheep industry." After working with sheep for his entire life, Mr Smith is now keen to encourage the next generation of young shearers, some of whom where involved with this record attempt.